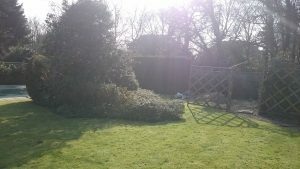 If I asked you to imagine your ideal garden, to think about the outdoor space of your dreams, what would it look like? 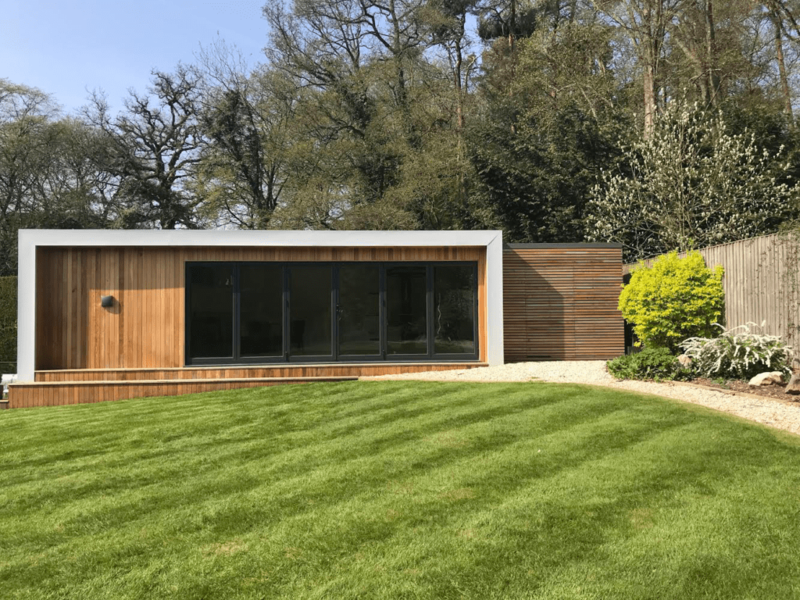 How about some beautifully kept floral borders, maybe a perfectly manicured lawn, a large well-kept space to play, some decking on which to relax with a book in the sunshine… perhaps even a swimming pool? For lucky Sadia and her family, a swimming pool in the garden isn’t just a dream! 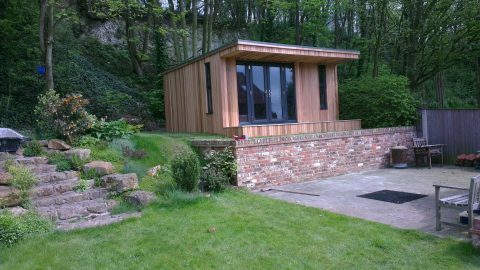 The family approached Modern Garden Rooms looking for a large poolside garden room for their outdoor swimming pool. 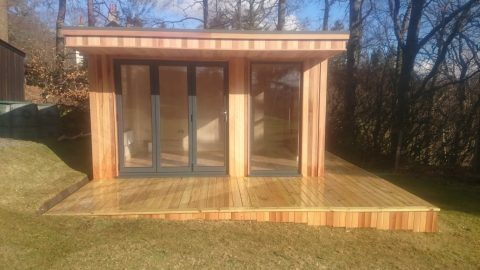 They wanted their new garden room to house a gym, with a shower room and a changing room for the pool. 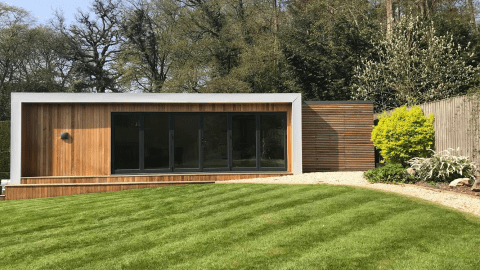 They also needed it to hide the pool pumps and equipment, and of course it also had to look fantastic in their beautiful garden. 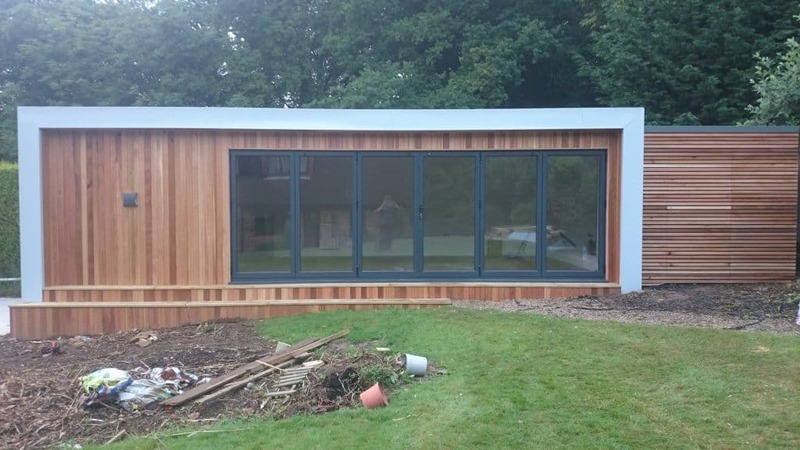 This build was a 9m x 5m Border Room with three separate internal rooms. 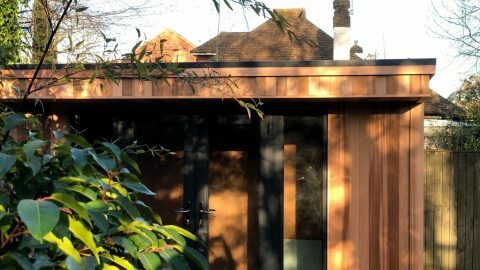 The timber-clad garden building had a separate shed to the side to house swimming pool pump equipment (not attached to the main building) with a hidden door. 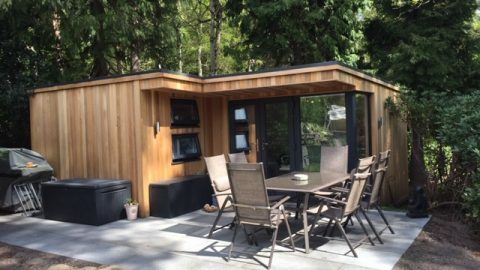 This needed to be a very large build, as the garden room had to serve several different functions. 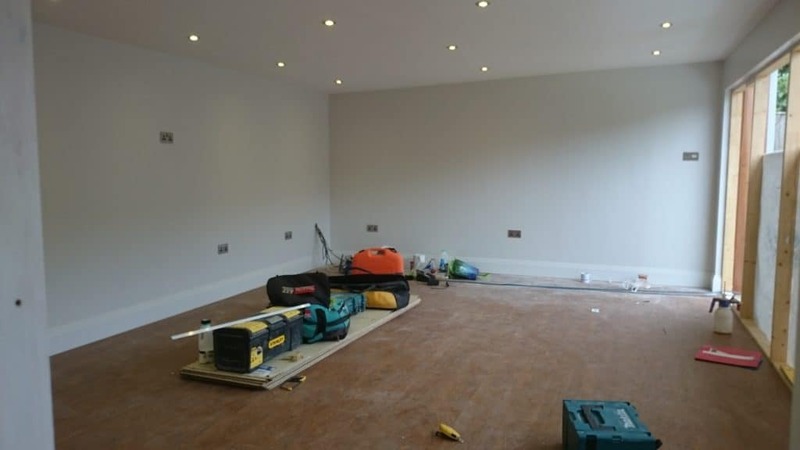 The main room was to combine a gym with a new office and a small but functional kitchenette area. 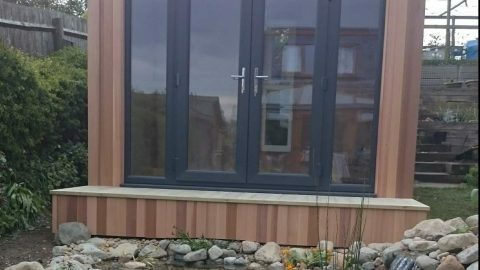 Sadia also wanted her family’s new poolside garden room to provide a changing area for the swimming pool to the side of it. 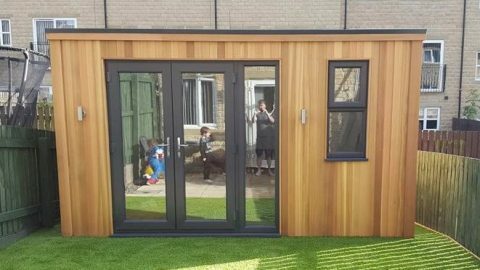 Alongside the large 9m x 5m room, the family wanted a way to safely house the pump and pool equipment out of reach and sight. 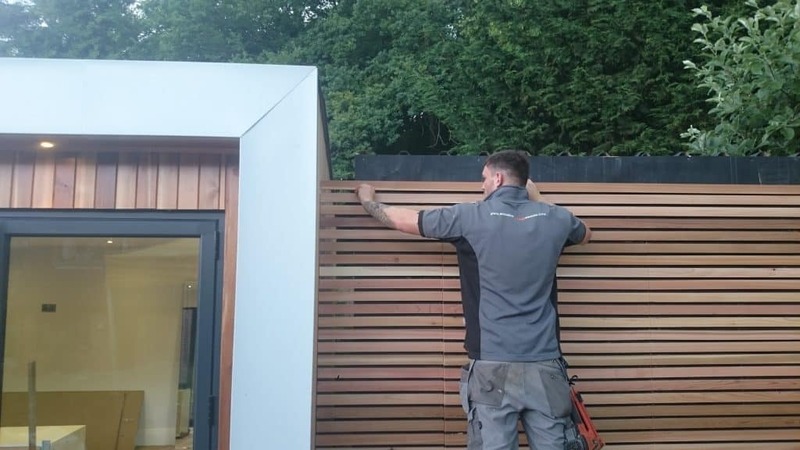 We suggested that a large, cedar-clad border garden room would look striking in the Sadia’s landscaped garden, whilst also being functional and providing all the space the family required. The room itself, a large 9m by 5m build, was split into three rooms. The main area was transformed into a large gym with areas for an office and a kitchenette, with a mirrored wall to one end of the gym. 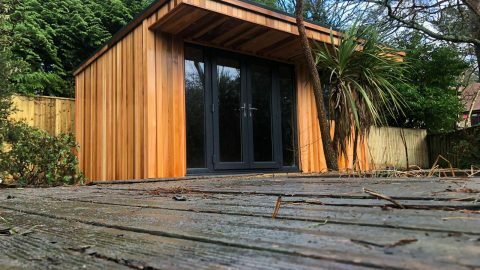 The second room became a changing room for the children to use before and after they went into the swimming pool located to the side of the garden room; this had built-in changing room benches. 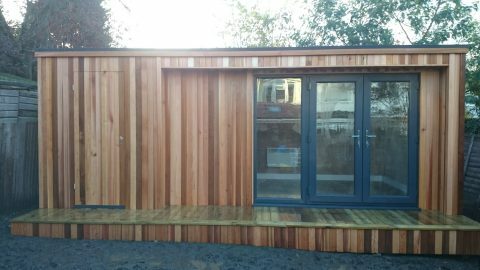 The third area was a shower room, plumbed in by a local contractor. Access to the building was via the front where a large set of French doors were designed to let light the maximum amount of light in, and there was also a door built to the smaller rooms at the side. 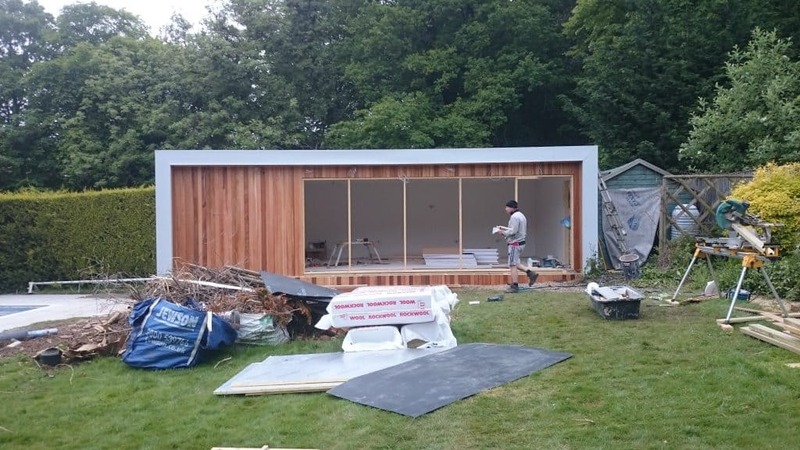 A separate shed to the side of the main building, which housed all the equipment and pumps for the pool, was all neatly stored away with access via a clever hidden door. Additional decking was built to wrap around the border room creating steps to the large doors. 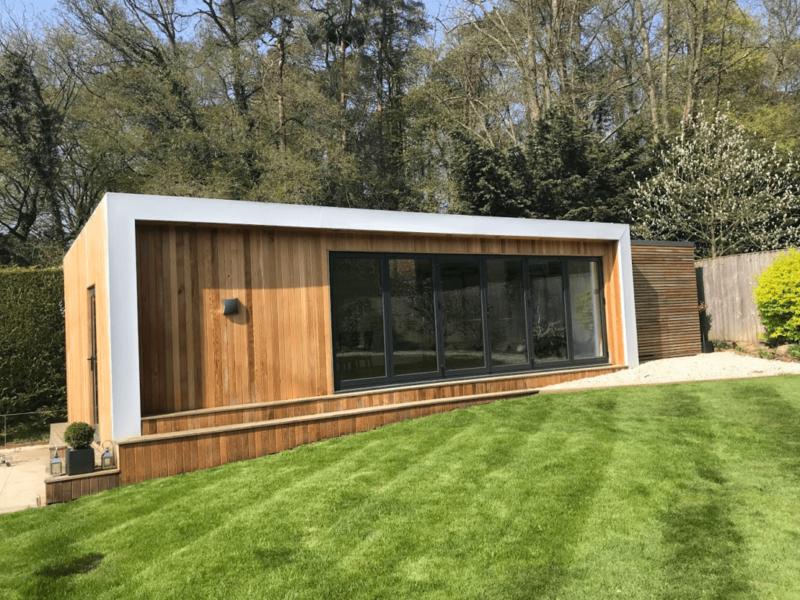 Pictured below, at one year ater the build, the building has been landscaped into the garden and I think you’ll agree that the pool room looks absolutely stunning.